The ultimate goal of your dealership’s webpage is ultimately to encourage those who view your webpage to visit your dealership. This doesn’t just happen. You can gear your website towards driving more people to your lot, but only if you know what works and what doesn’t work. 1. Large icons that tell your visitors what to do. Don’t hide the true intentions of your website. Those people visiting the website are already considering visiting you. If the website does not feel like you want them to visit you, they probably are not going to bother. If, however, you actually tell them to visit you, on a large, colorful icon on your website, they are more likely to do just that. These icons attract the attention of your audience, they tell them exactly what you want from them, and make the whole thing more compelling. 2. Create detailed pages for the vehicles on your lot. If you really want to encourage someone to come down to your lot, show them which vehicles you have available on your lot. This is one of the most effective ways to actually get more people to come down and visit your showroom. If they have already browsed your website and seen that you have the make and model they are looking for (or, at the very least, vehicles that they are interested in buying), you can easily encourage more of those people to come down to your lot and actually make a purchase. Present them with their options online. Videos are by far the most engaging pieces of content that you can include on your website. They are going to be much more effective than even written content or static images. A video of a vehicle or even just introducing your staff and what your site visitors can expect when they come to visit your website is a great way to start building that relationship that is fundamental to your success as a dealership. The longer you keep someone on your website, the more likely they are to come down to your dealership and visit you. A video has great potential for keeping those people on your website for a longer amount of time. 4. Allow people to leave reviews on your website. For most people, the image they have of a car dealership is one of swarming vultures, all trying to sell them the most expensive vehicle as quickly as possible. Even if that is not actually the image that most people have of car salespeople, it is still worth your time to generate a reputation as a friendly, convenient dealership that past customers have enjoyed working with. You can do this by allowing people to leave comments on your website or by curating comments from sources like Yelp for your website. This creates what is known as “social proof,” which dictates that people have less anxiety about making a purchase if other people have already made that purchase and benefited from it. Why bother with a responsive website? Because many of the people who are out already looking at vehicles are going to look for other dealerships on their cellphones. You are only going to be able to reach out to those people if you have a website that displays well on their mobile devices. A responsive website is now mandatory for just about every single business, and this is especially true of car dealerships, as many of your customers may be looking for you on their mobile devices, instead of on a desktop. This doesn’t just mean having your dealership’s main phone number available. It also means making sure that your physical and email address are readily accessible. All of this information should be on every single page of your website. Search engines will care about whether or not your contact information is easy for visitors to find, because your visitors care about how easy your contact information is to find. While this is important for every business, it is perhaps more important for dealerships, because you need site visitors to contact you or come to your showroom in order to actually sell that person a vehicle. 7. Display the prices of your vehicles. Whether you are just going to display the vehicles you have on the lot in a list or whether each vehicle gets its own page, it is worth your time to display the price of that vehicle on your website. Of course, the visitor could just go to the brand website and find out what the starting price is for the vehicle they want to buy, but it is much more valuable to keep that visitor on your website and to show them the price that they are estimated to pay if they buy from you. Especially if you are offering a special or some kind of deal, you should take the time to put your prices on your website. 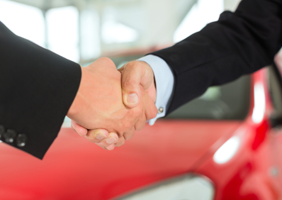 Getting people to leave your website and actually come to your dealership may seem difficult. You might see hundreds of visitors on your website each week, but only dozens of people actually visiting your showroom. These tips will help you get more of the people who visit your website to visit your dealership.